U.S. fintech group FIS is buying processor Worldpay for 20 times forward EBITDA. While there’s logic to rolling up companies with fixed costs and sticky clients, the price is punchy even for the fast-growing payments sector. The buyer’s own numbers imply disappointing returns. 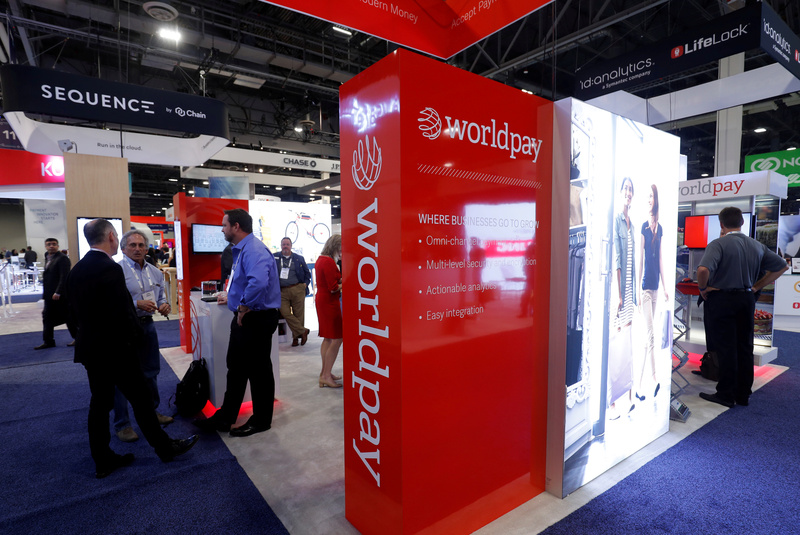 A Worldpay booth is shown on the exhibit hall floor during the Money 20/20 conference in Las Vegas, Nevada, U.S. on October 24, 2017. Fidelity National Information Services (FIS) on March 18 agreed to buy Worldpay in a cash-and-share deal valuing the payments processor’s equity at $35 billion. Worldpay shareholders will receive 0.9287 FIS shares and $11 in cash for each share. The deal implies an enterprise value of $43 billion, or 19.8 times the EBITDA analysts expect Worldpay to generate in 2019. FIS said it expected $400 million of annual cost savings in three years and $500 million of revenue synergies. Worldpay’s London-listed shares were up 11.3 percent to 82.5 pounds ($109) at 0900 GMT.